Thanks Jacque and TT, i was pleased to see the postie this morn, no bills for a change lol. How nice to get the card Eileen - hope she's having a good time, it will be nice when she's back. Nice of her to send it to you. So glad Amy is having a good time. Will be good to hear her news (and see photos) when she returns. Lovely card, wondered where Amy was! pleased she is enjoying her hols! 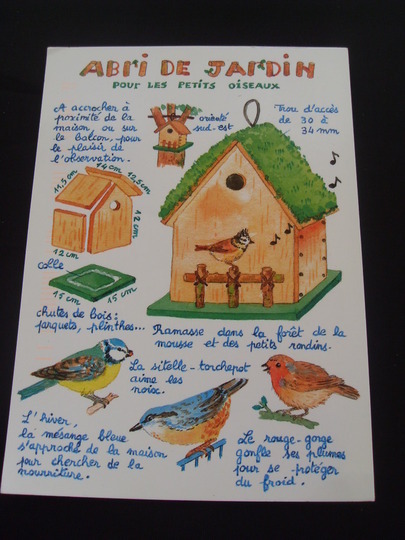 I wonder if Amy will bring back a bird box for her petits oiseaux. Lol. Mdr....... TT, thats what my son Jim calls me.....usually in Anthony Perkins voice from Psycho!...LOL! Janey ~ is Jim the one who appeared on your doorstep with flowers ? Surely he didn't use his Anthony Perkins mdr voice at that moment ??? We,ve had a wonderful time but right now we are very tired after driving such a long way .... Hywel ,i,m so sorry .. what was I thinking !! to much wine perhaps ..mdr ..., I,m keen to know how your mum is Hywel ?? Quelle blague! MDR...:-) Bienvenue, Amy! ~Un tour de force Mesdames et Monsieur! Bonjour..... Merci everyone ... it,s nice to be back amongst good GOY friends ..